CAT Prep Tips for beginners is probably something that cannot be covered in just one post. That is the reason why I am writing the second one in the series. I seriously recommend that you go through the first post on CAT Prep Tips for beginners before reading this. A lot of CAT aspirants / MBA aspirants believe that Coaching for CAT is compulsory. There are a few CAT aspirants on the other spectrum that believe that it is not required at all. I have been involved in the CAT coaching industry for over a decade and I have come to realize is that it completely depends on the student. CAT coaching does not really have that much of an impact on the end result. It provides CAT aspirants a direction to work in but that is pretty much it. If you think that your performance would be drastically different if you take CAT coaching or if you don’t – that is incorrect. It would primarily depend upon the time and effort you put in towards your preparation. CAT Coaching, at least the good ones, give you the right tools to study but if you are going to completely rely on the classes – it is not going to take you to your goal of a high percentile in the CAT exam. We have an unhealthy obsession with wanting the best things. We want the best returns on our investments, we want to eat the best food, and we want to practice from the best books / material. As there is no “Best Mutual Fund”, there is no “Best CAT Coaching Material” either. There are plenty of good ones and you should pick any of them. As long as you go through them in a proper fashion – you would fulfill your requirements. 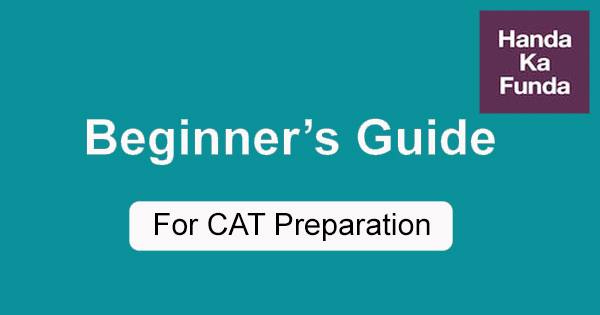 Please go through this detailed post on recommended books for CAT exam preparation. I am sure it would give you some insight on the topic. As far as Logical Reasoning and Data Interpretation is concerned – I do not think that there is a good book available for that considering the difficultly level in the LRDI section for the past couple of years. Still, you can read this post about best book for LR DI. Cracking a competitive exam in India is no joke. Getting into the top 1% in any field is difficult considering the amount of competition that exists. That is the reason a lot of students try to emulate what 99%ilers did without ever stopping to realize whether they are in the same boat or not. People who are just starting their preparation should not blindly rely on tips from 99%ilers. A lot of them would suggest stuff that worked for them but CAT Prep beginners fail to understand that it worked for the 99%ilers because they were capable of getting a 99%ile. They not only had the background preparation and clear fundamentals that were required for a 99%ile but also the right mindset. I am reminded of a story. Although Mozart was one in multiple centuries and there are 2000 people who get 99%ile every year but I hope you got the point that I was trying to make. I would also like to add that some 99%ilers do give out really good advice and suggestions but it would be difficult for you as a beginner to distinguish between the two. To help a CAT aspirant figure out the strengths and weaknesses in his preparation. None of the above is valid in case of someone who is just getting started with CAT Preparation. You should bother about a mock test series for CAT probably around July – August of the year you are planning to attempt CAT in. Even then, it should be done only if you are close to finishing your syllabus. I believe the ideal number of mocks for any student lies somewhere in the range of 5 to 15. 5 is the ideal number for people who are struggling to finish their syllabus and / or getting marks in the 70-80%ile range. 15 is probably suitable for candidates in the 95-99 %ile range. If and only if you are consistently scoring above 98 %ile, you should think about attempting more than 15 mocks. I believe that CAT aspirants develop an unhealthy obsession towards CAT mocks and the percentiles that they achieve in mocks. It gives them something to do. It validates their preparation. It gives them the illusion that they are not wasting their time. Nothing could be farther from the truth. I would like to repeat – Mocks are an important tool for CAT preparation but you should use them wisely and as a beginner – you should stay away from them. Learning – where you understand the necessary concepts involved. If you can dedicate roughly 100 hours to each one of the above categories, it should be enough. If you have more time on your hands that should probably go towards skill building. By skill building, I mean that you should do things which can help you perform well in CAT. For example, the time that a cricketer spends in the gym, helps him perform better on the field. Similarly, the time that you would spend reading books and novels, it will help you do better in the Reading Comprehension part of the CAT exam. Here is a list of books/novels that I recommend. I run an Online CAT Coaching Course so it is obvious that I would be biased. Having said that, I have taught at offline coaching institutes as well for a long time so I know about that process as well. While there are some obvious benefits of online preparation, the offline coaching institutes should not be ruled out either. Here is a simple beginners tip/question that should help you decide. How motivated are you as a CAT aspirant? If you consider yourself as highly motivated, then you should get a few books (or material from a coaching institute), a mock test series and that’s it. You can easily get by with that. If you can prepare by doing everything on your own, search for solutions and tutorials – you do not really need a coaching institute. A large amount of resources are available online for free and all you need to do is to put them to good use. It is not going to be easy but as a motivated aspirant, you should not face too much trouble. If you do not think that you will be able to take all the decisions on you own. If you are not confident of figuring out how to divide your time, how many mocks to take, and generally need a little bit of a helping hand – online coaching is better suited for you. Almost all online coaching institutes provide you with the necessary hand-holding. Once again, expect that you would be shown the door but do not expect a spoon feeding. If you are the kind of person who requires a kick on the backside to get into action, if you are the kind of person who believes in joining a gym because of the ideology – “If I have spent so much money, I would use it”, in that case offline coaching is what you should pick. Social media is a great tool. It can help you prepare for CAT. But sadly, people focus on the wrong things when it comes to social media. Nearly every Facebook group that I am a part of, nearly all Quora threads, nearly every Whatsapp discussion moves on the fringes of preparation and not actual preparation. It gives you the illusion that you are studying and learning new things but nothing could be farther from the truth. Even when students discuss actual questions, 90% of them are related to Quantitative Aptitude. Even when it is Quantitative Aptitude, 90% of it is related to Number System. Do you know how much Number System gets asked in the actual CAT exam? The answer is less than 5%. If there existed an ideal forum where CAT aspirants actually discussed helpful stuff, it would be of great use. There used to be such forums 5 years ago but not anymore. Learn to use the forums / groups wisely to clarify your doubts and get guidance but do not confuse them with serious CAT preparation. Study Plan for CAT 2018 Preparation – What to do from Today? HAHA…amazing “Nothing can be farther from truth” my personal favourite. but i am not so much motivated i need a kick on my backside to get into action.Sad but true!